Microsoft today is making a fresh build of Windows 10 available to both PCs and phones at the same time. Build 14267.1004 for phones is nearly identical to the build Microsoft released last week, but resolves two important bugs. For example, it fixed an issue that prevented the Lumia 550 from charging, and returned the "history" function to the People app. The build also introduces one new feature: visual voicemail for dual-SIM devices. Windows 10 Build 14267.1004 is available to Windows Insiders in the Fast Ring. Microsoft will push the build to devices in the Slow Ring later. Microsoft today released a new technical preview of Windows 10 Mobile for Windows Insiders. Build 10586.107 is a cumulative update and only makes some bug fixes and performance improvements. Microsoft called out adjustments to missing Start screen tiles, narrator behavior, and the reset experience. Microsoft also noted it will release technical previews in three stages moving forward, rather than two. Before today, it offered updates first to Windows Insiders in the Fast Ring followed by Insiders in the Slow Ring. Now, it has added the Release Preview ring, which Microsoft says is "best for Insiders who enjoy getting early access to updates for the Current Branch, Microsoft applications, and drivers, with minimal risk to their devices." 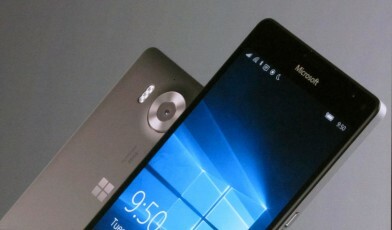 The latest preview will hit the Lumia 950 and 950 XL first. Microsoft is still working to bring Windows 10 to existing Windows 8.1 handsets, which it was expected to do late last year. Microsoft today said owners of the Lumia 950 and 950 XL can snag a free one-year subscription to Office 365 Personal. The subscription, which has a retail value of about $70, gives users full access to Microsoft Office (Word, Excel, PowerPoint) on their Lumia smartphone as well as a companion PC/Mac computer. The subscription includes 1 TB of OneDrive storage, as well, for syncing documents online. In order to access the free subscription, Lumia owners need to download and install the Lumia Offers application from the Windows Store. Users are required to provide an email address. Microsoft didn't say how long the offer will be available. 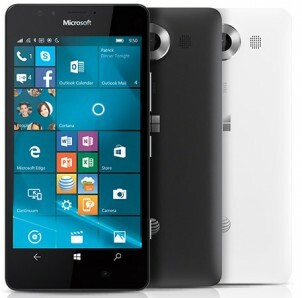 Microsoft and AT&T have confirmed that the Lumia 950 will be offered by AT&T. 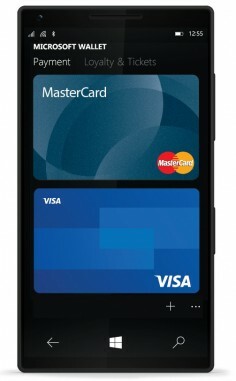 The phone will also be available unlocked directly from Microsoft. 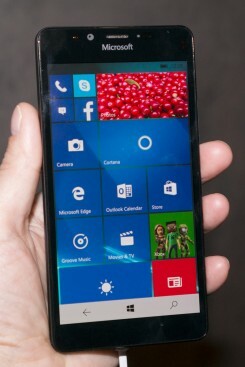 The Lumia 950 is Microsoft's flagship phone for Windows 10. It continues the Lumia line while showcasing the new, unified Windows 10. Not only can it run the same Universal apps that run on Windows 10 desktops, it can transform into a desktop computer itself with a dock accessory, running the same apps in desktop mode. It has high-end features and classic Lumia design. So how is it in person? Read on to find out. 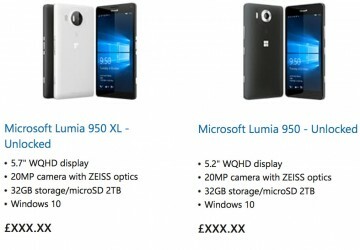 Microsoft today announced the Lumia 950 and Lumia 950 XL, its own flagship phones for its new OS, Windows 10. The phones support Windows Continuum for an optional full Windows Desktop experience when connected to a desktop monitor. The two models are similar, differing mostly in screen size; the 950 has a 5.2-inch screen, while the larger 950 XL has a 5.7-inch screen. Both screen offerings are OLED and Quad-HD resolution, the best available. Leveraging OLED technology, the phones also offer Lumia's low-power Glance notification display. Both phones also sport 20-megapixel cameras with Zeiss optics, triple-LED flash, optical image stabilization, and a dedicated camera button. Both phones also come with 32 GB of internal storage, plus a memory card slot supporting up to 2 TB. The phones are powered by Qualcomm Snapdragon 808 or 810 processors, with liquid cooling. The phones also sport USB Type-C connectors with fast data transfer and fast charging. A new Microsoft Display Dock accessory enables Windows Continuum. The Dock connects to the phone via USB-C, and to a desktop monitor via HDMI or DisplayPort. It also has tree USB ports for keyboard and accessories. Connected to the Dock, the phone can be used as a full Windows desktop running desktop versions of Windows Universal apps, including Office and Outlook. When using the Dock, the phone can access files on USB storage. Both phones will be available in November, for $549 and $649, for the 950 and 950 XL, respectively.